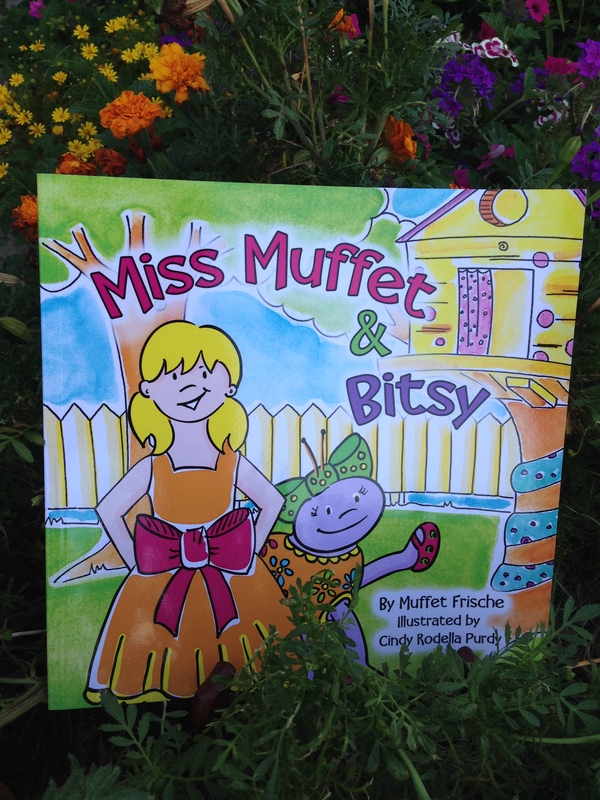 Keeping the value of Nursery Rhymes in mind, I love how Muffet Frische takes two characters, Little Miss Muffet and the Itsy Bitsy Spider, and puts them together in one story. Like you would expect, Miss Muffet is afraid of spiders. Her sister Anna isn’t afraid of anything. They live a colorful Victorian house. For Miss Muffet’s birthday, she gets to do one of her favorite things, decorate . . . everything: her birthday cake, her tree house that her dad built, and even herself as she’s having a costume party. Her Mom invites four of her friends and one is a new neighbor they haven’t met. 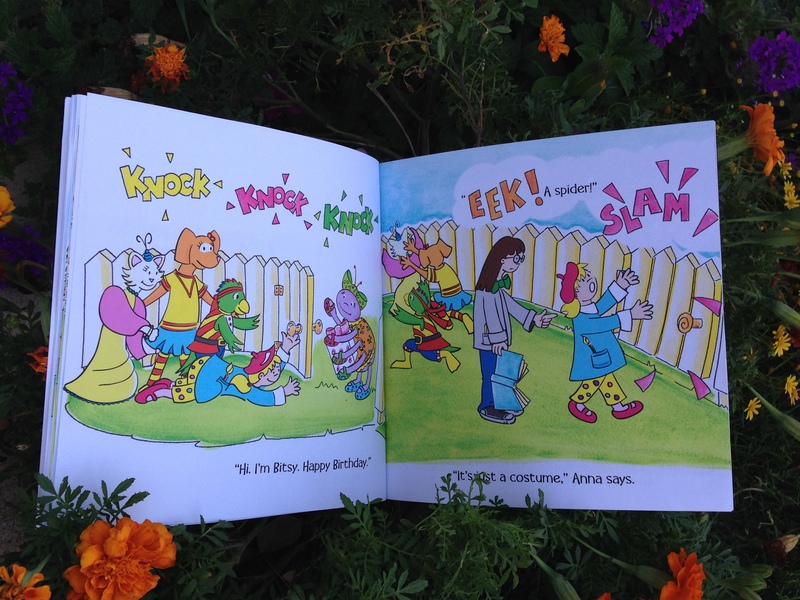 While Dixie Bell the dog, Prissy the cat, Patches the parrot, Anna the scientist, and Miss Muffet the artist are playing, their new neighbor arrives. Bitsy the spider! Like you would expect, Miss Muffet slams the gate and cries, “EEK!”. Then Anna reminds her that this IS a costume party. Convinced that her new neighbor is simply dressed up like a spider, Miss Muffet apologizes, welcomes her, and they have a blast. . . UNTIL it’s time to swim and Bitsy’s costume does NOT come off! Running to hide in the bathroom, Miss Muffet cries, “A spider lives next door! I’ll never go outside again!”. But then Bitsy does the unexpected: she flies past the bathroom window dressed up differently each time (my favorite illustration). How entertaining! 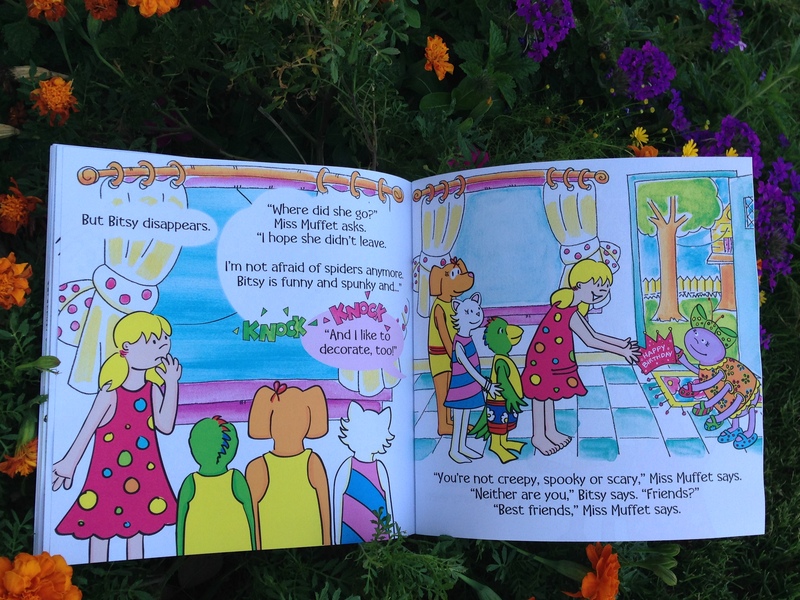 Miss Muffet and her friends realize Bitsy is really “funny and spunky”. “You’re not creepy, spooky or scary,” Miss Muffet says. “Best Friends,” Miss Muffet says. And they have the best birthday party ever! What a fun meeting up of two nursery rhymes from an author that shares a name with one of the main characters! Super cool. F- What makes you feel afraid? R- How can you relate to Miss Muffet when she finds out that what makes her afraid really is not so scary after all? Do you think that something you fear may not really be that scary? I- Imagine you are invited to Miss Muffet’s costume birthday party. Look back at what costumes Miss Muffet and her 5 party guests wore to their party and write a list of the guests and outfits. What costume would you pick out to wear? Why? E- Explore a Nursery Rhyme book with your kids and have them memorize one a week and earn something fun that fits the rhyme. For example, learn Pat-a-Cake and then bake a cake with a B on it; learn Working on the Railroad and buy a new little train, learn Humpty Dumpty and make eggs together. Be creative and reward them in fun ways! N- Navigate through the story of how Miss Muffet went from being scared of spiders to being best friends with one! What made her change her mind about spiders? Make a timeline of what happened and include her thoughts and feelings along with the events. THEN, make a timeline for yourself of what makes you afraid and track your progress of overcoming that fear. D- Develop either your own nursery rhyme or your own illustration of your favorite nursery rhyme. Guess who’s moving next door to Miss Muffet’s family? Oh no! The new neighbors are spiders! This time Bitsy did NOT scare Miss Muffet away! *Check out Tuesday’s blog post (8/12/14) to read an up-close-and-personal blog from Muffet Frische. 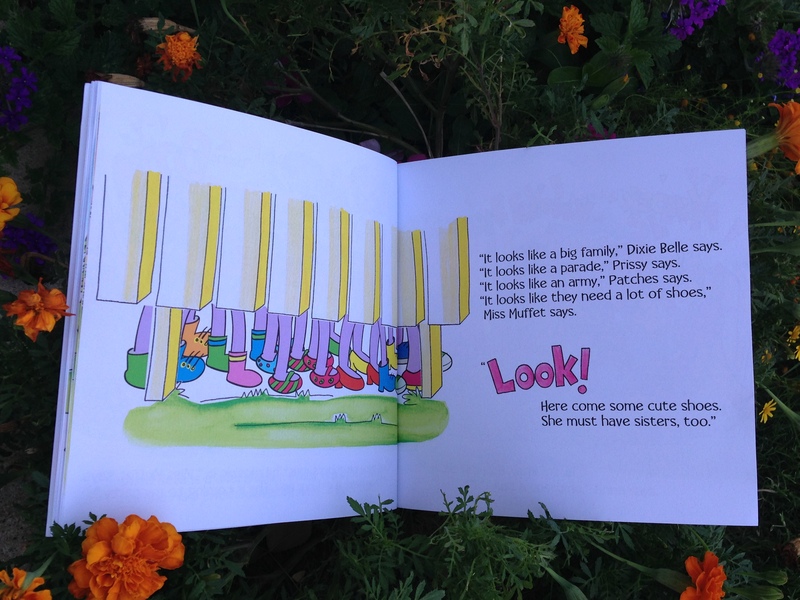 This entry was posted in Guest Bloggers, Nursery Rhymes and tagged Cindy Rodella Purdy, creative cat media, Importance of nursery rhymes, Itsy Bitsy Spider, Little Miss Muffet, Mem Fox, Miss Muffet & Bitsy, Mouths of Mums, Muffet Frische, Reading Magic. Bookmark the permalink.